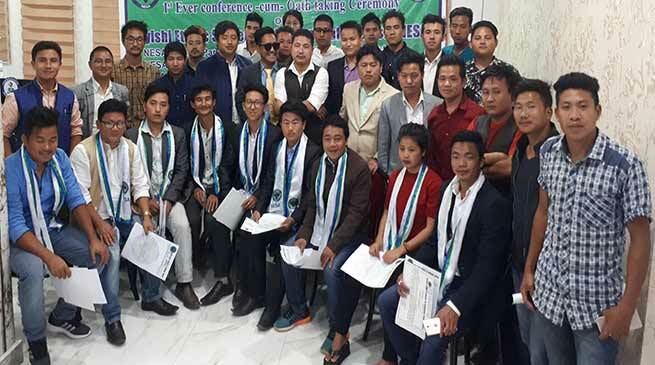 The Nyishi Ethnic Students of Arunachal Pradesh (NESA) in it’s first Conference held in Itanagar resolved to take up several social issue of the community and development of area in particular and state in general. Addressing the conference NESA President Biri Chatum said that “our society is a big society in state and . Our people living in rural areas, and border area are facing lots of challenges which need to taken up by the society, youths as well as by students bodies. We being the intellect and youths should delivers our responsibility in raising several issues and developmental matters related to education and society as a whole. He also appeal all likeminded people to come forward to support in resolving many social evils practice in society and also preservation of art, culture, tradition, protection of local dialect etc. General Secretary Tadar Janu while emphasis on celebration of Nyokum celebration by one all for promotion of tradition and culture and speaking of local dialect in all day to day life as well as wearing of traditional attire and dress for protection of community identity and traditional value. All speakers including of Papum Pare district and central executive committee raised the issue of proper Inner Line Permit checking in capital complex, deplorable education scenario, development of educational infrastructure, Implementation of RTE in proper way. District Unit President and General Secretary of Kurung Kumey, Kra Daadi, East Kameng, and Kamle also address and raised key issue in their district and appeal the parents organisation in solving the issue from time to time as per need of the society and area. Several Executive Members of the Organisation from Kurung Kumey, Kra Daadi, East Kameng, Kamle and Papum Pare was also appointed and oath was also administered by the central executive committee members.